Practice your posture with Shortee club. Although clubs are different lengths, the basic golf posture remains the same. One key point to remember is to try to keep your spine in a neutral position, not too straight or not slumped over. The purpose of the golf posture is to create a position from which you can make an athletic swing. Alignment is the easiest fundamental to work on, and probably one of the most neglected principles of golf. A good shot is useless unless it is going toward your intended target. Rehearse set-up position with the Shortee club. Set up in front of a mirror and notice your hand position, the angle of your shoulders and width of your stance. Use a professional golfer as a model. Take care to get into an athletic position that you can repeat. Spend 2 to 3 minutes adjusting your stance until it feels comfortable. Hold the Shortee club and practice placing your hands on the club. Place your hands on the club in the correct position. Hold position for 5 to 10 seconds. Memorize the feel. Take your hands off the club and then place your hands on the club again. Do this exercise 2 to 3 times. 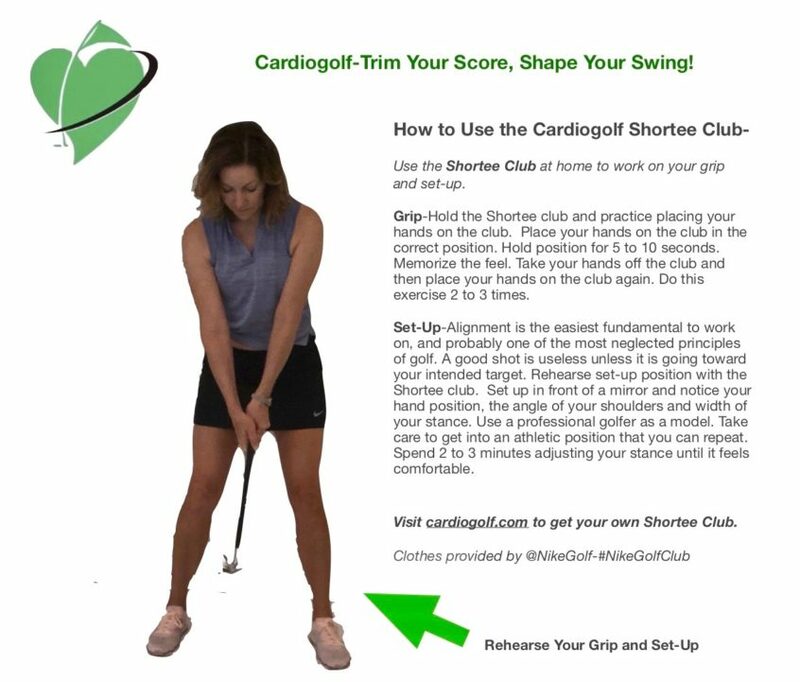 To get your own ‘Shortee’ club visit Cardiogolf.com. love my Shortee club. It’s so easy to use and keep handy while I go about my day. i had to change my grip last year, and this helped me with the ‘feels’ of that change. Karen, you have created a fantastic program for everyone who loves the game. I practice daily with my Shortee club. I have several clubs that in handy places and it’s a wonderful way to build confidence with the golf positions while off the course or driving range.